While Krishna’s expansions and incarnations perform duties in the material and spiritual worlds, He Himself simply enjoys with His most intimate devotees in His transcendental home, known as Goloka. By His desire, His associates there don't even consider Him God. They enhance His enjoyment in five loving moods: neutrality, servitude, friendship, parental affection, and conjugal love. 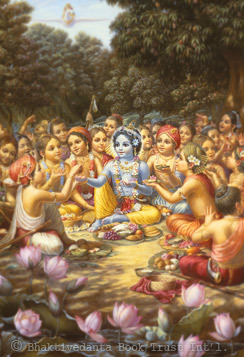 In other words, Krishna’s life is filled with unending bliss in the company of His associates. Krishna enjoys Himself with abandon, frolicking as a youth in expansive fields and forests with His friends and cows. He dances, He plays His flute, He relishes whatever activity strikes His fancy at the moment. To entice souls in the material world to join Him in Goloka, Krishna comes to this world periodically, as He did 5,000 years ago, and shows His confidential, intimate loving exchanges with His ever-liberated devotees.